Graz is a city in Austria famed for its contemporary and medieval blend of architecture and art. With a population of around 300,000, it is the capital of its province and second largest city in Austria. Narrow streets lined by stores and popular attractions such as Schloßberg, Kunsthaus Graz and the Styrian Armoury are some of its many marvels. Cheap flights to Graz are now available for a limited period of time, so get ready for this spirited city to captivate your senses! Graz is home to Graz Airport (GRZ), which is a 20-minute drive or 15-minute train ride from the city centre. 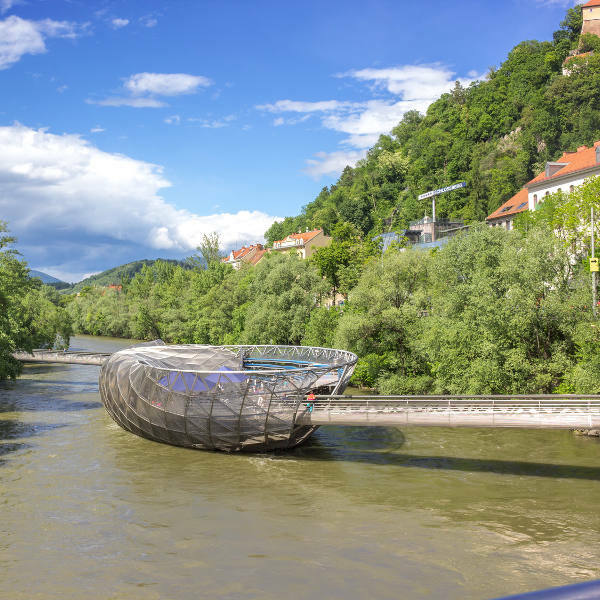 Take in the sights of the unique creations in the Kunsthaus Graz modern art museum and explore the epic Murinsel floating platform in the River Mur. Graz is a city of astounding creative innovation. Being Austria’s capital of culinary delights, Graz plays host to various restaurants in Hauptplatz main-square. Indulge in fresh produce, delicious meats and maybe a touch of the local delicacy, pumpkin oil. Revel in the ambiance of the Renaissance and Baroque architecture native to Graz. 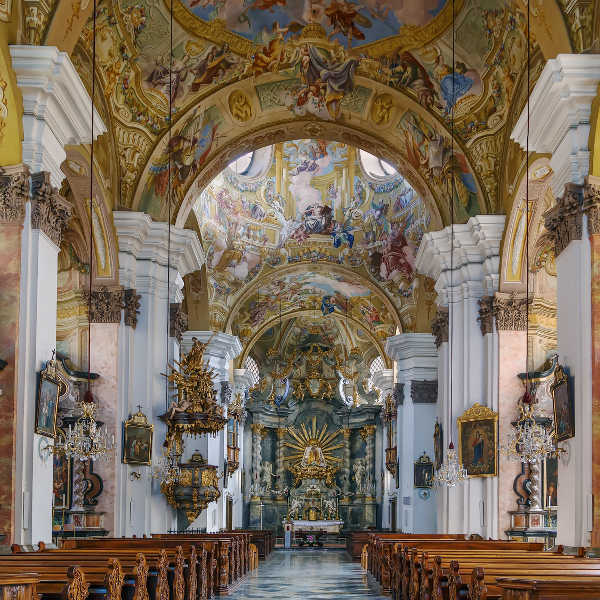 Visit the Mariatrost Basilica Catholic church or the most significant Baroque palace in the region, Eggenberg Palace. With the exhilaratingly vast amount of experiences Graz has to offer, the months between April and September are the best time to visit if you prefer mild temperatures. The fresh alpine and continental climate accommodates cool, rainy summers during the June to September period. These months are fitting for a guided tour of the majestic forested park and former hilltop fort, Schloßberg. Enchanting twilight walking tours of famous attractions such as the Murinsel, or a melt-in-your-mouth experience with traditional and trendy culinary delights, are also popular activities during this time. As July and August are peak travel months in Austria, prices are generally higher and the city may be crowded. You are however always invited to take a transcendent journey of discovery with the all year round walking tour through the Graz city centre. Graz is a future-forward, yet distinctly medieval European city that boasts a unique blend of architecture, art and culture. Graz is one of the 2011 Cities of Design and the 2003 European Capital of Culture. Testament to this is the Kunsthaus Graz modern art museum and spectacular Murinsel floating platform in the River Mur. You may want to make time to discover other marvels such as the Schloßberg Hill or the Uhrturm centuries-old clock tower. The narrow streets of the city’s main-square, Hauptplatz, are host to incredibly inviting restaurants. Here you can indulge in a glass of the region's rosé or treat yourself to delicacies created with fresh produce and delicious meats. 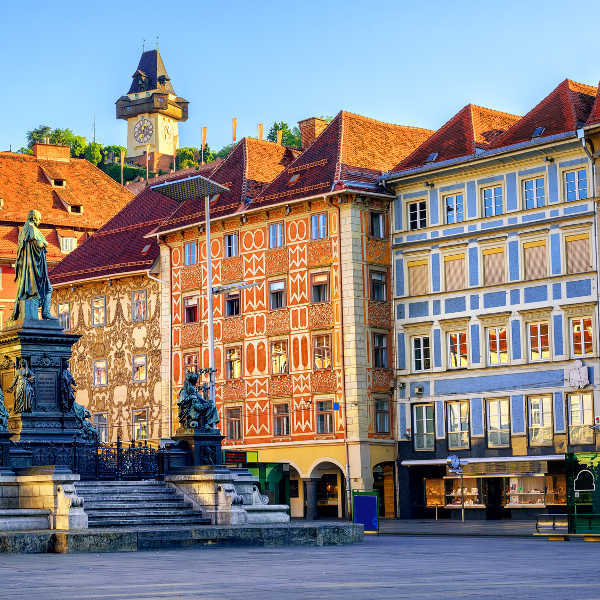 Farmers’ markets like the Kaiser-Josef Market are great to explore alongside the locals, while picturesque terrace restaurants in southern Graz provide a fancier wine and dine atmosphere. A trip to this vibrant city that is constantly buzzing with creative innovation is a bucket list must! Compare several airlines, and book your cheap flights to Graz online at Travelstart! Before travelling to Graz, ensure that your routine vaccines, including MMR, tetanus, chickenpox, polio and yearly flu shot are up to date. There are no special medications or immunisations required to enter Graz. Graz has a low crime rate and is a fairly safe city. However, you are advised to practice general safety precautions, such as taking care of valuables and documentation. Keep an eye out for common crimes such as pick-pocketing at train stations, on crowded buses and at the airport.